When I finished writing “Time Is Irreverent,” and pitched the novel to various people in the industry, I often had to answer the question “What book is yours most like?” Because “Time Is Irreverent” is unique, my honest answer should have been “none.” But that’s not the way the game is played. So for lack of a better answer, I always said “The Hitchhiker’s Guide to the Galaxy” by Douglas Adams. This screen shot is from today’s Amazon US Best Seller chart for Humorous Science Fiction. 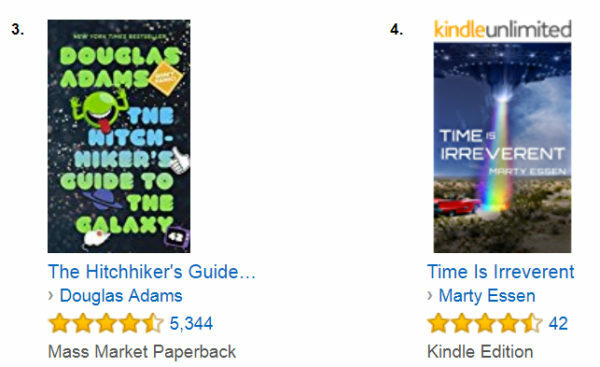 Coincidently, Douglas Adams is at #3 and I am at #4. Also our respective books both have average ratings of 4.5 stars. So perhaps we have more in common than I thought. But, being that I’m a living author and Adams is not, I’m all for stopping what we have in common at this point.